The idea behind this stag and doe cake is that my nephew Kyle and his bride-to-be Meagan have a stag and doe party planned with a hunting theme – she caught him and the hunt is over. They had photos taken in our bush and I was asked to create a cake with this theme. So after much thought, I put all my love into it and came up with my own idea. I started with two white cake mixes – Duncan Hines are my favorite. I find that their mix is the best for formed pans and have used their’s for 30 years now. I used a large Wilton Cake pan, spreading crisco shortening and flour sprinkled on top. After following the directions I evenly spread the cake mixture into my pan. I baked this double sized cake for 50 minutes at 325 degrees. I used a Buttercream Icing – one half cup crisco shortening, one half cup butter- mix together with beater. Add one and one half tsp. vanilla, 5 cups of icing sugar and 3 tbsp milk. Now the fun begins – I chose Ivory icing color to spread in the middle of my cake. Then I took chocolate icing just to outline the lines for a camouflage effect. From there I used Juniper Green icing color, Moss Green icing color and Black icing color. I then filled in chocolate markings with these colors, spreading out the colors of each to create a camouflage look. After this was done, I added a few extra details with the colors making sure all spaces were filled in. Because this is a stag and doe cake, which is tomorrow night – April 4th, I have not yet had comments other then my husband who likes hunting himself and he was impressed! 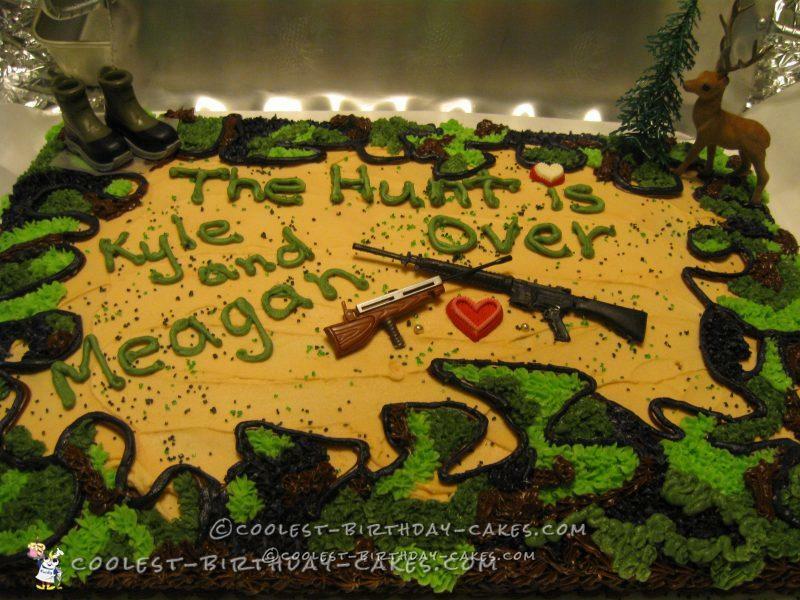 I personalized my cake putting on the title “The Hunt is Over” followed by their names – Kyle and Meagan. 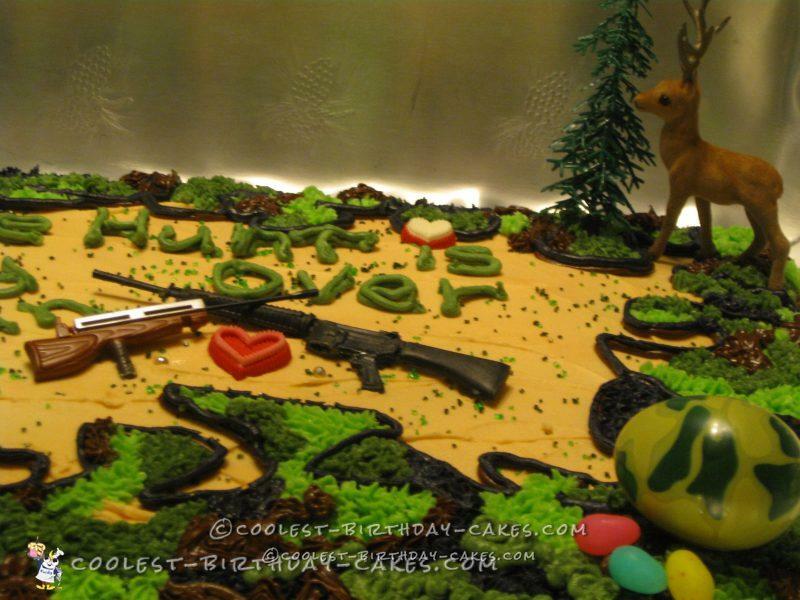 My additions to my cake included a plastic deer beside a tree, and a pair of Hunter’s Boots as well as two rifles criss-crossed with a heart in between. It was a lot of fun, I enjoyed doing this for them, and I am sure they will be quite pleased. After this photo I am sending, I decided to add the Easter theme, as their stag and doe party is the night before Easter Day. I added a camouflage egg and a few jelly beans, just to tie in Easter too. I will let you know how people liked it, with their comments after tomorrow night.